This has been on my heart for several days and I know the Lord wants me to share this with anyone who has an ear to hear…. Let us make every effort to go before the Lord and examine our hearts with His help to see if there is any sign of “yeast of the Pharisees” in us or in our churches. Let us make every effort to repent and to enter into the kingdom of God and His grace and LOVE. What we say we believe when we are at church and what we say in our hearts or around others who do not profess to follow Christ is heard by our Lord. He knows! What are the secret motivations of your heart? Are they out of love and faith in God – or fear, pride, selfishness, complacency…? Most born again believers in Jesus do know 2 Chronicles 7:14 or have heard this verse quoted before, especially lately, in America. It was brought to my attention yesterday and on my mind again this morning, that we who are called by the Lord’s name are the ones who are to humble ourselves…. It seems like we hear a lot about how other people should humble themselves. Or, we hear a lot about how hateful and arrogant other people are for their unbelief. But, what about the criticisms that we as the Lord’s people have of others and each other? It is going to take each individual born again believer to come to terms with the concept and principle that the Lord presents to us in this verse. No matter what all is wrong with everyone else in the world, each of us has the responsibility to answer to God for our own self, first. After we get our own hearts right with our Lord and examine our own ways and allow Him to transform us from the inside – out, then we can move on to being who He created us to be in this world. We are to be salt and light and we cannot do that if we are pointing our fingers at everyone else. Instead of complaining and grumbling about what is wrong in the world around us and being discouraged by our own failures, we should humbly come before the Lord and confess our need of Him. We should pray and seek His face and turn from following our own ways. We should be thankful and praise Him for all of the work that He has already done for us, in us and through us. Most of all, we should thank Him for Jesus, who paid the price for our lives, souls, salvation, healing and victory in this world and in the next. Something to think about for us, today. 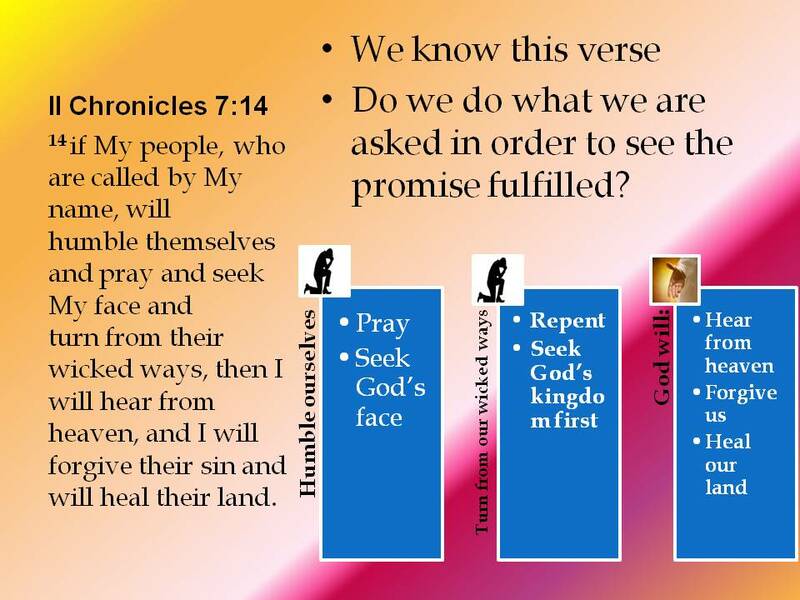 We know the words of 2 Chronicles 7:14, but do we take it to heart for our own selves? When we do, we will see the kingdom of God manifesting all around us 🙂 God bless you! Miracles happen not just because of our faith but Love unlocks the supernatural power of God because He is Love. When we are praying for a miracle for ourselves or for another person, we must come to the Lord not only in faith, but also with a heart of compassion and love. 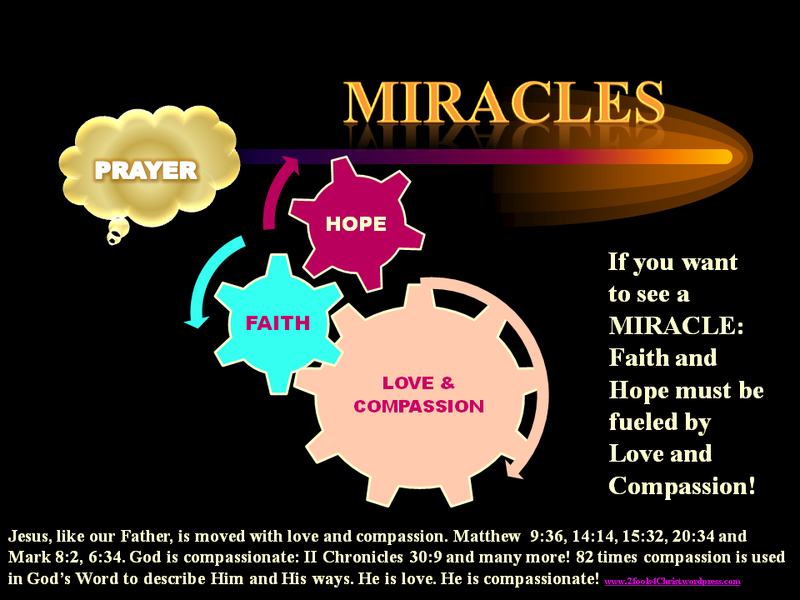 When we pray for a miracle for ourselves, we must know that God is compassionate and that Jesus is moved with compassion. We must trust that He loves us and wants the best for us. We can know that He will make a way where there seems to be no way because of His great love for us. Jesus is the Way! We can trust in the Lord’s compassion for us because the Bible is full of reminders of His great love. If we are praying for a miracle in a loved one’s life or in another person’s life then we should be praying for them out of a heart of compassion and love and trust that Jesus also loves them and so does our Father. If we are praying for a loved one out of a heart of judgment, condemnation, criticism, aggravation or frustration then we will not see the wonder working power of God at work. Love for another and compassion for someone else moves us to stand in the gap for them and pray for God’s mercy and love to be at work in their life. Evil is overcome by good. Hate is defeated and deflated by love. We forgive others because we have been forgive of so much. We pray for others because our heart is broken that they are wandering in darkness when we know that they don’t have to be in darkness any longer. We pray for others because we know that our Father loves them and wants to heal them, bless them, show them the Way, keep them from stumbling, give them hope and so much more! Our prayers are hindered when we pray out of wrong motives. BUT: When we forgive others and love them with the love of Christ, seeing into their heart and not judging by only what we see, but look deeper into that person’s heart and see that we are all in need of love and compassion and mercy and pray the same type of prayers for them that we pray for ourselves, then we will see miracles! Any motives beyond love and compassion hinder our prayers. Love and compassion and humility open doors – the doors to a move of God like we haven’t seen! Look past the illness, the addiction, the pain, the lifestyle, the sin, the hatred, the darkness TO THE PERSON! Every person, including yourself, equals a hurting heart and soul that Jesus bled and died and rose again for, so why wouldn’t He want to heal every person and set every person free? Jesus was moved with compassion and healed! Mark 8:2, Mark 6:34, Matthew 15:32, 20:34, 14:14, 9:36 and God is compassionate! II Chronicles 30:9 and many more! Get in on the love and compassion of our Father in Christ! Be unified in the Spirit of Love and power of Jesus! Compassion and compassionate are in the Bible over 100 times as used to describe God, Jesus and those who are in Christ, believers in Christ. because that cloak is the only covering your neighbor has. What else can they sleep in? When they cry out to me, I will hear, for I amcompassionate. And the Lord said, “I will cause all my goodness to pass in front of you, and I will proclaim my name, the Lord, in your presence. I will have mercy on whom I will have mercy, and I will have compassion on whom I will havecompassion. then the Lord your God will restore your fortunes and have compassion on you and gather you again from all the nations where he scattered you. But the Lord was gracious to them and hadcompassion and showed concern for them because of his covenant with Abraham, Isaac and Jacob. To this day he has been unwilling to destroy them or banish them from his presence. “Because of your great compassion you did not abandon them in the wilderness. By day the pillar of cloud did not fail to guide them on their path, nor the pillar of fire by night to shine on the way they were to take. So you delivered them into the hands of their enemies, who oppressed them. But when they were oppressed they cried out to you. From heaven you heard them, and in your greatcompassion you gave them deliverers, who rescued them from the hand of their enemies. “But as soon as they were at rest, they again did what was evil in your sight. Then you abandoned them to the hand of their enemies so that they ruled over them. And when they cried out to you again, you heard from heaven, and in your compassion you delivered them time after time. [ Psalm 51 ] [ For the director of music. A psalm of David. When the prophet Nathan came to him after David had committed adultery with Bathsheba. ] Have mercy on me, O God, according to your unfailing love; according to your great compassion blot out my transgressions. Relent, Lord! How long will it be? Havecompassion on your servants. You will arise and have compassion on Zion, for it is time to show favor to her; the appointed time has come. He has caused his wonders to be remembered; the Lord is gracious and compassionate. Even in darkness light dawns for the upright, for those who are gracious andcompassionate and righteous. Let your compassion come to me that I may live, for your law is my delight. Your compassion, Lord, is great; preserve my life according to your laws. For the Lord will vindicate his people and havecompassion on his servants. Their bows will strike down the young men; they will have no mercy on infants, nor will they look with compassion on children. The Lord will have compassion on Jacob; once again he will choose Israel and will settle them in their own land. Foreigners will join them and unite with the descendants of Jacob. When its twigs are dry, they are broken off and women come and make fires with them. For this is a people without understanding; so their Maker has no compassion on them, and their Creator shows them no favor. Yet the Lord longs to be gracious to you; therefore he will rise up to show youcompassion. For the Lord is a God of justice. Blessed are all who wait for him! Shout for joy, you heavens; rejoice, you earth; burst into song, you mountains! For the Lordcomforts his people and will have compassionon his afflicted ones. “For a brief moment I abandoned you, but with deep compassion I will bring you back. In a surge of anger I hid my face from you for a moment, but with everlasting kindness I will have compassion on you,” says the Lord your Redeemer. Though the mountains be shaken and the hills be removed, yet my unfailing love for you will not be shaken nor my covenant of peace be removed,” says the Lord, who hascompassion on you. [ Praise and Prayer ] I will tell of the kindnesses of the Lord, the deeds for which he is to be praised, according to all the Lord has done for us— yes, the many good things he has done for Israel, according to hiscompassion and many kindnesses. Look down from heaven and see, from your lofty throne, holy and glorious. Where are your zeal and your might? Your tenderness andcompassion are withheld from us. But after I uproot them, I will again havecompassion and will bring each of them back to their own inheritance and their own country. “This is what the Lord says: “‘I will restore the fortunes of Jacob’s tents and havecompassion on his dwellings; the city will be rebuilt on her ruins, and the palace will stand in its proper place. Though he brings grief, he will showcompassion, so great is his unfailing love. With their own hands compassionate women have cooked their own children, who became their food when my people were destroyed. As I listened, he said to the others, “Follow him through the city and kill, without showing pity or compassion. No one looked on you with pity or hadcompassion enough to do any of these things for you. Rather, you were thrown out into the open field, for on the day you were born you were despised. “Therefore this is what the Sovereign Lordsays: I will now restore the fortunes of Jacob and will have compassion on all the people of Israel, and I will be zealous for my holy name. I will betroth you to me forever; I will betroth you in righteousness and justice, in love andcompassion. “How can I give you up, Ephraim? How can I hand you over, Israel? How can I treat you like Admah? How can I make you like Zeboyim? My heart is changed within me; all mycompassion is aroused. [ Jonah’s Anger at the Lord’s Compassion ] But to Jonah this seemed very wrong, and he became angry. He prayed to the Lord, “Isn’t this what I said,Lord, when I was still at home? That is what I tried to forestall by fleeing to Tarshish. I knew that you are a gracious and compassionate God, slow to anger and abounding in love, a God who relents from sending calamity. “This is what the Lord Almighty said: ‘Administer true justice; show mercy andcompassion to one another. “I will strengthen Judah and save the tribes of Joseph. I will restore them because I havecompassion on them. They will be as though I had not rejected them, for I am the Lord their God and I will answer them. “On the day when I act,” says the LordAlmighty, “they will be my treasured possession. I will spare them, just as a father has compassion and spares his son who serves him. When he saw the crowds, he had compassionon them, because they were harassed and helpless, like sheep without a shepherd. “I have compassion for these people; they have already been with me three days and have nothing to eat. Therefore, as God’s chosen people, holy and dearly loved, clothe yourselves withcompassion, kindness, humility, gentleness and patience. As you know, we count as blessed those who have persevered. You have heard of Job’s perseverance and have seen what the Lord finally brought about. The Lord is full ofcompassion and mercy. [ Suffering for Doing Good ] Finally, all of you, be like-minded, be sympathetic, love one another, be compassionate and humble.